As a pet enthusiast, it is just normal to spend time studying what is proper for them to use and consume and what are the things that they have to avoid. Knowing the best dog food for German Shepherd, for example, is necessary because I would not like my dogs to digest something that is going to have a disastrous effect on their overall health. I am sure you are here too because of that same reason. Choosing food for them gets extra tricky because we should take into consideration a particular nutritional demand for this special breed. I can remember clearly the first word I uttered when I saw a German Shepherd – handsome! Yes, he was like the Adonis of dog breeds (confident, poised, muscular, tall, with well-proportioned built and perfectly colored fur), well at least for me. Males are basically 24 to 26 inches tall and females can grow up 22 to 24 inches in height. They are naturally courageous. They are physically healthy making them a perfect fit for tedious tasks such as assisting handicapped people, helping search and rescue operations, detecting illegal drug substances, and even herding other animals. This very intelligent breed is a good choice for military and police service. Given the abovementioned level of activity, your German Shepherd must enjoy, you have to remember that you should choose foods that will replenish the nourishments lost. Let us use the guidelines given by Association of American Feed Control Officials in this segment. Old dogs or those who have a sedentary lifestyle should be limited to 1,272 to 1,540 calories on a daily basis. On the other hand, if your pup is vigorous you may give them as much as 1,740 to 2,100 calories per day. Protein should be the star component of your beautiful dogs. These furry friends should have at least 22% to 40% superior protein on their diet generally. Old German Shepherd must be given at least 18% and lactating female shepherds should receive 22% protein. The safe percentage for your German Shepherds carbohydrate intake would be between 5% and 8%. GSDs are typically full of life; they need carbohydrate to provide them fuel. However, overfeeding them with carbohydrates can make them gain weight, just like how humans are. Vitamins and minerals are also a crucial part of their diet. This is to maintain proper functioning of their vital organs, nerves, preserve their cognitive skills, and of course to maintain their wonderful physique. Please give your German Shepherd Dogs only excellent meats. You must double check the source if they are approved by the Food and Drug Administration. Do not feed them expired products. The origin of your fats should be of high standards as well. Fats from animal sources are highly recommended. Check your sources of carbohydrates. Opt for barley, potato, rice and rolled oats as these foods are easy to grind hence digestion and absorption of the nutrients will not be a problem. Primarily, this may differ from one pup to another. German Shepherds can also develop allergies. Foods causing that will then be a red flag. Apart from that, avoid wheat based products, soy, and corn because they make the digestive system exert more effort as they are not easy to digest. These products are also allergens for a number of dog breeds. Go natural as much as possible. Avoid foods with preservatives if you can. Investigate if the food contains dangerous chemical; if so, do not feed your German Shepherds with it. As much as possible, avoid animal bi-products. These substances contain digestible and indigestible parts and could be harmful to our doggies. Grain fillers can cause allergic reactions to your GSDs. Avoid corn, soy, and wheat. With this, it is not advisable to feed your doggies with leftover dinner. Your doggies cannot verbalize how they feel but you may observe red watery eyes, frequent scratching, inflamed paws, frequent coughing and sneezing, and gasping for air. They could die if they experience bronchospasm or the inflammation of airways. To be on the safe side, bring your pets to vet once the last 2 symptoms are observed. German Shepherds love eating flesh or meat. Commercial dog foods are prepared in wet, semi-moist and dry. Wet foods are soft and are claimed to be really delicious, hence it has a higher price compared to the other two. They can spoil fast and their taste can alter so only open it when it is already your dog’s meal time. Semi-moist food can be stored opened longer than wet foods without much change in taste and quality. Unfortunately, most semi-moist foods are smothered with preservatives and even food coloring. Many dog owners are also claiming that their pups manifest unusual metabolism when fed semi-moist foods. Lastly, we have dry commercial foods. If your German Shepherd enjoys hard or crunchy treats, this will be perfect for them. Feeding your pets dry food will promote their oral health. Regrettably, some dry foods are not preferred by dogs mainly because they are somehow tasteless. Raw dog foods were created due to increased public demand. They are made of natural ingredients and you are required to prepare them first before serving. This is perfect if you have the luxury of time. Feeding German Shepherd Dogs are also extra special because the need to switch from puppy food to an adult food should be done 6 months from their birth. Normally, you do this transition after 1 year for other breeds. This is done because GSDs belong to large dog breeds. This technique will alleviate them from growing too fast which could be hazardous to their health. Arthritis and Hip dysplasia can either be congenital or developed as your pup grows. This can be addressed by giving them a diet with reduced calories. The aim is to lessen the weight of the German Shepherd Dog with the intention to remove the added pressure on joints. Gastric dilation-volvulus is also common to our GSDs because they have a huge thoracic cage. This can be fatal if not addressed properly. Bloating happens when their stomach is filled with gas, but it gets more complicated than that. Their stomach can actually rotate and cut the supply of blood and oxygen to certain vital organs in due course. Observe the following signs: and symptoms and if present, bring your doggie to a veterinarian immediately (1) distended stomach, (2) excessive salivation, (3) you have seen your dog trying to vomit but is unsuccessful, (4) dog starts to become less lively and alert and, (5) if your pet faints. Malnutrition is also a problem to the animal kingdom especially the domesticated ones. Feeding your pets with excessive calories without them utilizing it through physical activities may cause the increase in weight thereby causing obesity. Contrary to that, inadequate feeding may cause them to be underweight and weak. There could be another ground for your dog’s thin appearance and that is exocrine Pancreatic Insufficiency. This is a metabolic problem that can be addressed by giving them a diet that has low fiber and fat but with high digestible carbs. In all the consumer products we need to purchase, our budget has to be deliberated. If you have low budget, I highly suggest for you to make your own healthy dog meals. Then again, if you have no limits when it comes to finances, go ahead and but commercially prepared foods for them. It is very important to know the level of activity of your German Shepherd. With this in mind, you can adjust the nutrition and diet of your dog accordingly. Choose water and food receptacle that prevents your German Shepherd Dog to gulp their liquids and meals all of a sudden. Let them rest after eating. Do not feed them the same stuff every meal, every day, for several weeks. Learn the art of meal planning. Feeding our pets is so similar to feeding our babies. We have to be very careful with what we feed them because it can either make them healthy or sick. I am so excited to present the best food choices for our dear GSDs. I have arranged this alphabetically according to the life stages of your dogs for your convenient. I have created an assortment as to the type and flavors so that you can also have an idea about the varieties out in the market. You might be wondering why you have not seen SportDogFood Elite Grain Free Dog Food as well as Halo Vegan Garden Medley Stew for Dogs on my list. Please do not get me wrong; they are great choices, has received commendable ratings, and are packed with very nutritious substances. I myself would give these products 5-stars. However, I would recommend these superfoods to German Shepherd Dogs with special needs like hypersensitivity issues or other health concerns as it is quite expensive compared to the ones on the list. It would just be very biased to include distinctive diets to the options I will present to you. For puppies, we highly recommend CANIDAE Life Dog Food It was assumed to be very delicious based on the reactions of the German Shepherd Dogs feeding on it. It is nutrient packed and made of natural products as well. It would also not give you a headache or hassle as you transition since this food is for all stages. If you notice your pups getting bored with it, you can always switch flavors from a number of choices. For adult dogs, I choose to suggest EUKANUBA Breed Specific Adult German Shepherd Dry Dog Food. It is super packed with vitamins, minerals and immune boosters specifically made for our German Shepherds, has 3D DentaDefense System, and most of all, it’s ingredients provide a generous source of protein for my beloved doggies. This food provides unique protein sources for our growing puppies. It is also filled with insoluble fibers promoting ease in their digestive tract. It also provides nutrients that can enhance healthy development of joints. They give out supplements that can protect our dogs from inflammation of joints as they age. As we have discussed earlier, dog food should fit the age and activity level of our pets. This dry good has ingredients that support and contribute to the overall growth of our furry friends. It also provides necessary supplements to boost the immune system of our young German Shepherds as the system is not yet matured enough to protect them. A USA-made product, this food is good for large breed doggies. This wet food has used natural broth to further enhance the taste. The food is packed with meat and vegetables that can help our babies feel full longer despite their growing physique and an increased activity level. If you are worried about transitioning your dog foods eventually, choosing Canidae can help you as this is suitable for all life stages already. All you have to do is to switch from one flavor to another as you have lots of options to choose from. Isn’t these reasons good enough for Canidae to be your best choice? Well, for me they are! This is one of the best choices out in the market primarily because it is made with natural products. Aside from that, Purina Beyond Natural gives your dog nourishment without grains or gluten. This particular dog food is also void of preservatives. You have several selections to choose from: (1) beef potato, and green bean, (2) chicken, lamb, and spinach, (3) Turkey and sweet potato, (4) chicken, carrot and pea, and (5) salmon and sweet potato. Are you confused with all the yummy flavors presented? You need not worry because you can go for the variety pack! It has 2 chicken, carrot and pea, 2 salmon and sweet potato and 2 beef, potato,and green bean. This will enable you to identify which your dog loves best. I believe this is the perfect bet for all owners who are health-conscious themselves, which is why I suggest that you buy your German Shepherd Dogs natural food sources such as Purina’s too. What specifically made it to my list is that it was made of real roasted meats. My dogs are picky eaters and just like me, they also get easily bored when fed the same thing. However, with Taste of the Wild’s dry dog food, they seem to enjoy every serving of it every single time. This provides a powerful source of proteins, antioxidants, and supplements for our furry friends. The immune system of the GSD is also assisted since this dry dog food is also rich in antioxidants – fighting off free radicals and cancer cells. This Taste of the Wild dog food is also advised by many veterinarians if the GSDs are overweight since it can provide nourishment without giving off too many calories. What makes this the best choice is that although our German Shepherd Dogs love roasting, it can be a tedious process for the owners. Thanks to Taste of the Wild dry dog food, we no longer have to undergo lengthy processes just to produce high-quality roasted goods for our German Shepherd Dogs. This product allows us to spoil them without spending too much effort! Some dog owners reported that their dogs were allergic to it. Aside from the very attractive packaging, (pardon me I really have to mention it as appreciation), this dog food has an edge because it has 3d DentaDefense System. This promotes the oral health of your German Shepherd Dog by decreasing the chances of accumulation of tooth tartars as long as 28 days. Eukanuba can also help your pups get healthy fur because it is a good source of fatty acids such as omega 6 and omega 3. Because of the special feature (3D DentaDefense), this product becomes suitable for busy owners – imagine feeding them with a diet that cleans and protects the teeth! This should also be picked as one of the best because this dog food is manufactured especially for our dog breed, it contains super nutrients, probiotics and most of all… dental care assistants! Owners have reported allergic reactions such as digestive problems. In a world where Genetically Modified Organisms are rampant, it is not surprising to get ourselves and our German Shepherd Dogs exposed to these consumables. Nutro Wholesome Essentials particularly addressed that concern by making sure to pack only the best kind of lamb meat in their products – those which are pasture fed. This dog food is also designed for large breeds; hence, you may expect that this product is full of protein. The manufacturers instilled generous amounts of glucosamine and chondroitin to help promote healthy growth and development. This dry meal is also enhanced with antioxidants that can help boost their immune system, vitamins and minerals like vitamins A, B, C, D, folic acids and more. Making your German Shepherd Dogs eat this meal from Nutro will possibly give you peace of mind as you are already feeding them a well-balanced diet made from natural ingredients that is why I highly recommend you to choose this. This product is made from 100% premium natural sources. Most dogs love its flavor that is why many dog owners are happy with it. Aside from the delicious taste, dogs are getting added benefits from it in the form of additional nutrients infused in the item. Not like the others, this dog food has limited carbohydrates, thus, it is perfect for German Shepherd Dogs who are trying to lose weight because of health reasons. Not only that, I think that this product is truly recommendable because it also contains DHA and EPA. You can also find a rich source of Omega 3 Fatty Acids in this dry good. I advise dog owners to feed their GSDs with Orijen 6 Fish Grain-Free Formula especially when they are experiencing joint pains or are manifesting problems in the heart. This product is protein-packed and contains 20% fresh fruits and vegetables thereby limiting its carbohydrate contribution. This product is a complete meal tailored specifically for our GSDs. Promises to fit the longer transit time within the digestive system of our pups. They also provided specific fibers to restrict fermentation in the intestine. This Dry food also promotes the natural flora in our doggies intestinal system. I believe that on top of the fact that Royal Canin has been in the industry for so long, they already know what the best for our pups is and this is a great plus for them. If you can remember, I have also suggested for you to use their products on your GSDs. This product is perfect for busy dog owners like me. All you have to do is to serve and you no longer have to worry about them receiving balanced and nutrient-packed meal. The keyword ‘complete’ called my attention that is why I included this dog food in my list. Apart from the fact that it was specifically designed for large dog breeds such as my German Shepherd Dog, their claim of providing all-natural dog food was an instant plus for me. Complete, balanced, and natural; what could I possibly ask for? Yet, it does not only go for the food pyramid. The manufacturers included lots of other sources to supplement folic acid, biotin, vitamin c, vitamitn d, zinc, and lots of other vitamins and minerals. At times, we dog owners just do not have the luxury of time to feed our dogs with a separate source of nutrients such as vegetables and fruits. That’s why I chose this product to be included in my top list. Well, that is apart from the fact that the latter food group easily spoils, right? If you are sharing this dilemma with me, Wellness Complete Health Natural Dog Food will be the solution for your problem. Wilderness Blue buffalo is renowned for manufacturing protein-rich dog foods. It does not have animal by-products in their ingredient. This dog food is fortified with probiotics. On top of that, this energy source is also a good source of vitamins and minerals such as Vitamin E, Iron, Zinc, Calcium, Vitamin B complex, Vitamin A, and the likes. 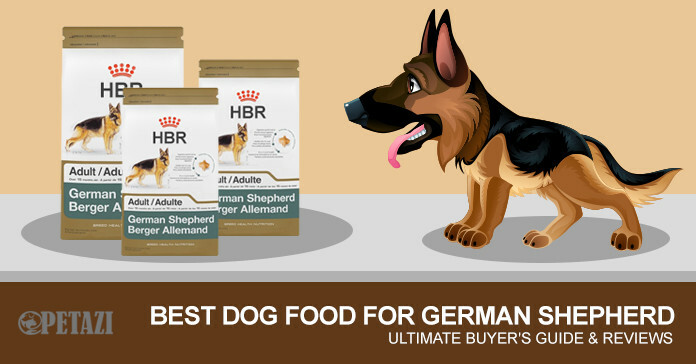 What makes it very perfect for your German Shepherd Dogs is that it does not only contain meat products, you can also find nutrient-filled fruits and vegetables like blueberries, cranberries, apples, spinach, pumpkin and more. If we are talking about a complete meal, this dog food can certainly be your choice. I understand this task could be meticulous but it should not make you feel stressful at all. I hope that this guide is able to give you a good selection so that all you have to do is to order them. What do you think about my recommendations? Tell us which dog food for German Shepherd is the best for you in the comment box below. We are so excited to hear from you!